Artist and curator, Nerys Johnson was born in 1942 in Colwyn Bay, North Wales, and raised in Mansfield, Nottinghamshire. She trained in Fine Art at Newcastle University from 1961, and went on to settle in the north east of England. After graduation she taught before being appointed Keeper of Fine Art at the Laing Art Gallery, Newcastle. In 1970 she took up post as Keeper-in-Charge of the Durham Light Infantry Museum & Arts Centre, where she stayed until her retirement due to ill-health in 1989. She died following surgery in 2001. On her retirement in 1989, Nerys devoted herself full-time to drawing and painting and it will probably be the work of the last twelve years by which she will be chiefly remembered. Flowers had long been Nerys' principal subject-matter. 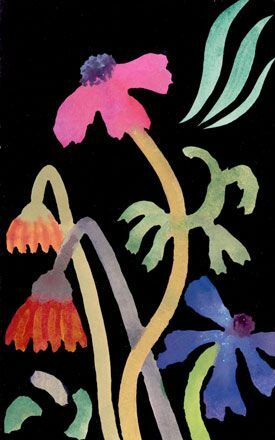 For someone who was increasingly confined to her house in Durham, flowers were readily available, and she could get in close to explore colour and structure in near-abstract compositions. But she was also interested in flowers as they budded, bloomed and then faded, and her awareness of the tradition of painting flowers as emblems of mortality runs parallel to her concern with form. 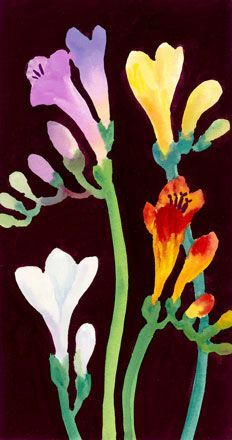 Nerys said of her work: "For a long time, flowers have been a major source of inspiration for my work. They are alive, and I try to convey that sense of living. They grow, change, decay and metamorphose. In a drawing, the sense of movement, structure and rhythms is expressed through the marks and lines; in a painting, this is achieved through the balance and contrasts of colour. Whether the flowers are grouped in a riotous bunch or [shown] singly, my aim is to reveal the particular feeling of that image - a potent lily, a burst of spring or the battered remains of winter". Kate Evans, ‘Nerys Johnson: Flower Painter with Attitude’, illustrated article in Artists and Illustrators, March 2000. Julian Spalding, ‘Nerys Johnson: Artist whose work defeated her disability’, obituary in The Guardian, 4 July 2001. David Buckman, 'Nerys Johnson', obituary in The Independent, 30 August 2001. Julian Spalding, ‘Nerys A Johnson (1942-2001); Artist and Gallery Curator', in Durham Biographies, VI (County Durham Local History Society, 2009).